PlayStation Plus December Games Unveiled | Nerd Much? Yesterday we found out what Microsoft’s Games with Gold slate would be for the final month of the year, and today brings Sony’s offerings. 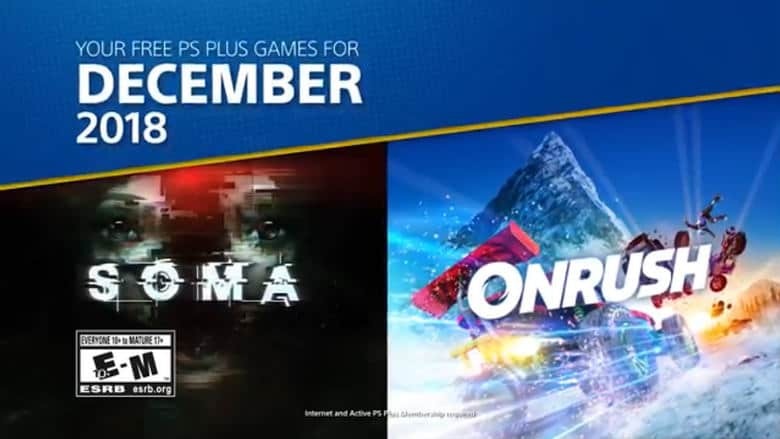 The PlayStation Plus December lineup has been announced. Many fans seemed underwhelmed by the Games with Gold titles this month, the judging by comments many are feeling similarly about Sony’s side of things. But there certainly appears to be a few gems included here as you’ll read below. Beginning December 4th PlayStation 4 owners with PlayStation Plus can download Soma free of charge. Many folks loved the game for its story-driven atmospheric sci-fi horror. The PlayStation 4 version holds a 79% on Metacritic, so it’s clearly a solid offering. Also on December 4th PlayStation Plus players can download Onrush. With a 76 Metascore, Onrush is described as “an all-action, gravity-defying, racing game.” The title was nominated for “Best Audio Design” at The Independent Game Developers’ Association Awards in 2018. Finally, we have a couple of PlayStation Vita titles coming our way too. The first is Iconoclasts which just launched for earlier this year. It’s a 2D platformer with Metroidvania-style gameplay that is also compatible with PlayStation 4 cross-play. The second PlayStation Vita title is Papers, Please. The indie designed puzzle game won numerous accolades for its ingenuity when it arrived initially in 2013 on PC. It’s a fantastic add if you’ve yet to experience it. There aren’t any PlayStation VR titles in the PlayStation Plus December slate, so you’ll have to choose from what’s above to get your free gaming fix. We’ll be back toward the end of the year to report on what January has to offer.